Katherine completed her articles with Koskie Minsky LLP and joined the firm as an associate following her call to the Bar in 2012. She practices in the area of labour law. 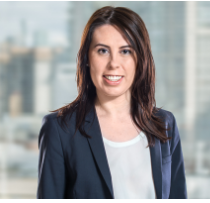 Prior to joining the firm, Katherine obtained a Bachelor of Arts (Honours with Distinction) in Psychology and a Masters in Industrial Relations from Queen’s University. She completed her law degree at the University of Western Ontario. During law school, Katherine was a research assistant in the areas of labour relations and human rights law.